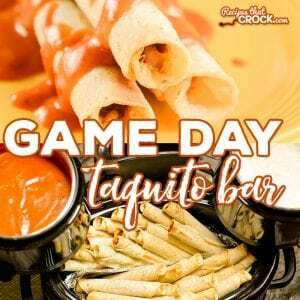 Game Day Taquito Bar - Recipes That Crock! 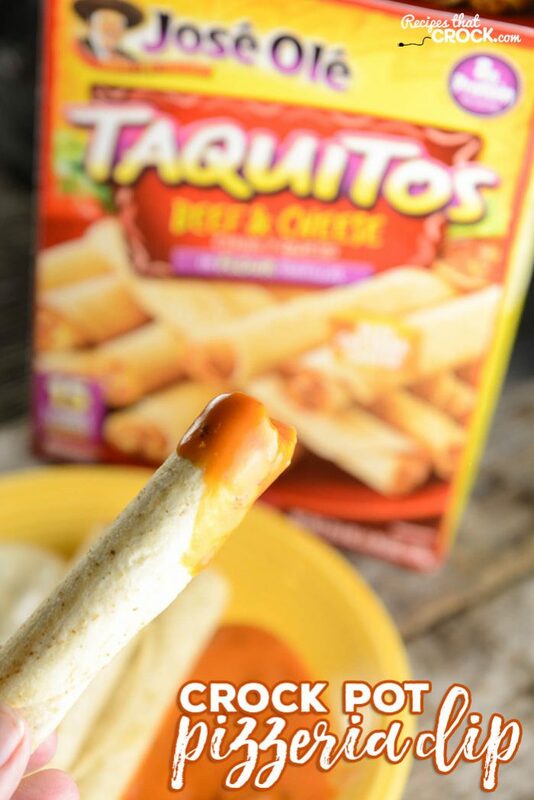 Do you love serving Taquitos at your potluck, party or tailgate? Our Game Day Taquito Bar keeps your favorite game day snack nice and toasty while serving it up with our Crock Pot Pizzeria Dip and Crock Pot Cream Cheese Enchilada Dip. Recently José Olé reached out to me and asked me if they could sponsor me to create a game day recipe for the Big Game. You might recall that last year we whipped up some Game Day Taco Nachos last year and loved them, so I got to crockin’ in the kitchen to whip up something new this year with their Chicken & Cheese Taquitos and their Beef & Cheese Taquitos. 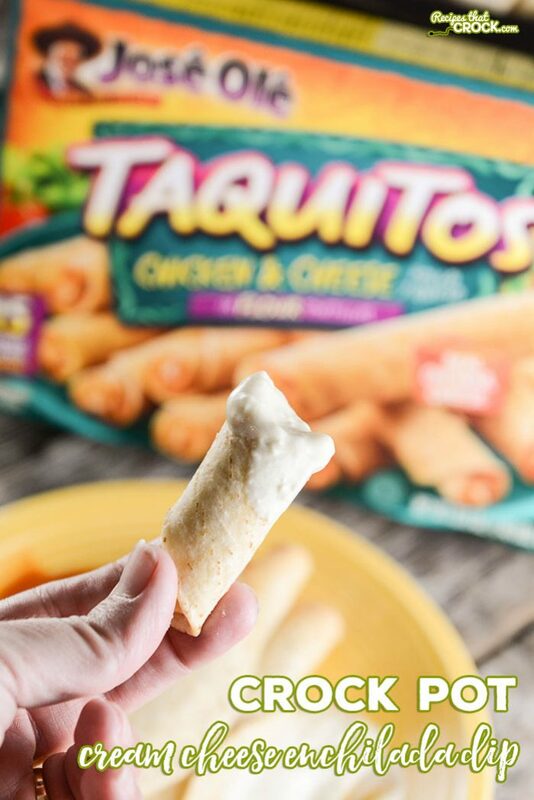 One of the reasons I chose to create a Game Day Taquito Bar is that we love to toast up our taquitos in the oven and we LOVE to keep them warm during serving by placing them in our crock pot without the lid. With the lid off, it keeps the taquitos warm and keeps the moisture out. When serving different flavors of taquitos, we take aluminum foil and divide the crock so everyone grabs exactly what they want. When you team up that toasty tip with two tasty dipping sauces, I call that a winning team… see what I did there ;). Our two dipping sauces in our Game Day Taquito Bar were inspired by the two flavors of José Olé Taquitos we toasted up. We made a Cream Cheese Enchilada Sauce for the José Olé Chicken & Cheese Taquitos for a creamy traditional flavor. 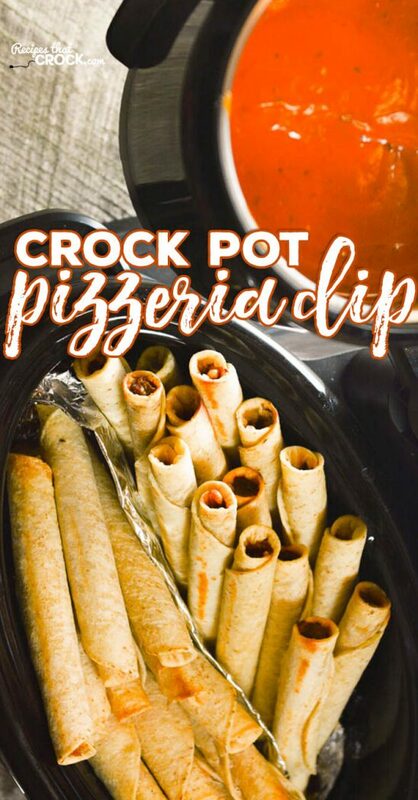 The second dip, Crock Pot Pizzeria Dip is inspired by Miss Add and it goes perfectly with the Beef and Cheese Taquitos. 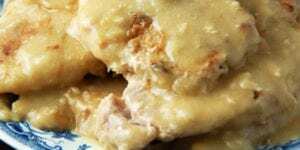 Our Crock Pot Cream Cheese Enchilada Dip is inspired by our favorite creamy chicken enchilada casserole which is made with flour tortillas. José Olé ‘s Taquitos are made with flour tortillas too and when you combine their cheesy chicken flavor with a dip made of cream cheese and green sauce, it is the perfect way to serve up these snacks with a nod to our favorite casserole. Every time Miss Add and I go to a Pizzeria, she will ask for both nacho cheese AND marinara sauce to mix together and create a yummy dipping sauce for her breadsticks. So when I was thinking of what dip I wanted to pair with José Olé ‘s Beef & Cheese Taquitos, I decided to go an nontraditional route and pair an Italian inspired recipe with a Mexican inspired snack and it totally worked! It was a huge hit! And, Miss Add approved ;). 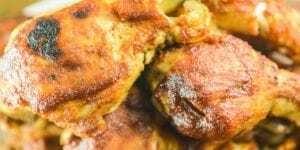 Place cream cheese and enchilada sauce in a 1.5 quart slow cooker or small heat safe bowl inside a larger slow cooker and cook on high for 1 -2 hours stirring occasionally until smooth. 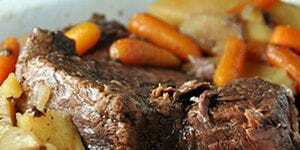 Once dips are warmed through and smooth, turn slow cooker(s) to warm. Bake Jose Ole Taquitos in the oven according to the package. Meanwhile, preheat a 4-6 quart slow cooker on high with lid off. Fold a large piece of foil to serve as a divider in your large crock pot and place beef taquitos on one side of the foil in the pot and the chicken on the other side. Leave the lid off and turn the slow cooker to low. 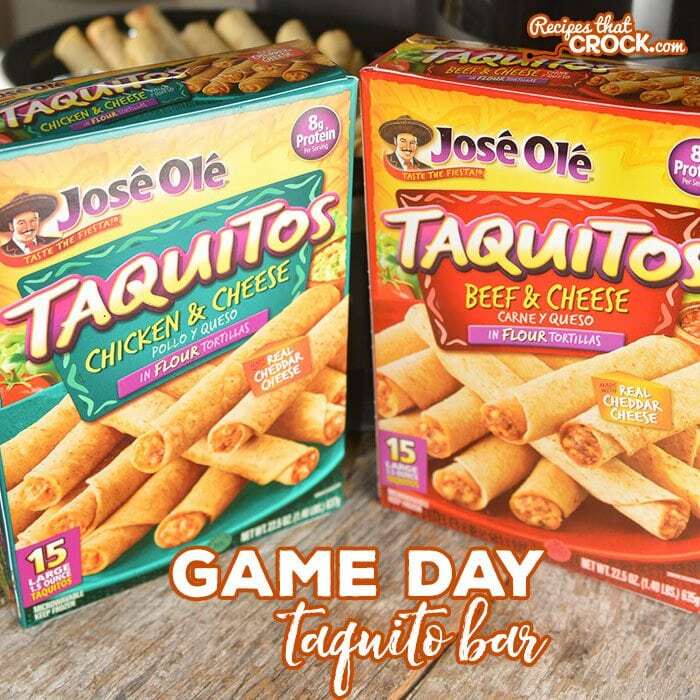 To help you celebrate all your game day eating and to thank José Olé for sponsoring this post, how about a little Recipes That Crock Giveaway? We want to give one lucky Recipes That Crock Reader a new Swing and Serve Crock Pot to help them cRock their big game! Simple. Just comment below and tell me which José Olé snack is your favorite or which one you would like to try (choose from the products here) in the comment box and tell me that you did in the contest box below! This giveaway is sponsored by Recipes That Crock only and not associated with Jose Ole, Facebook or Instagram. Contest ends at midnight on 2/1/2017. Winner will be notified by email and will have 48 hours to respond. 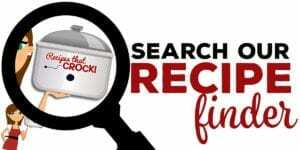 Winning crock pot will be shipped to continental U. S. addresses only. Model and color not guaranteed. Must be 18 to enter. GOODe Luck! What and awesome idea! I love taquito’s and so does my husband! This would be a perfect set up for holidays too! 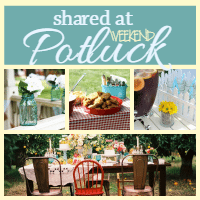 What a great idea and use of the Crock Pot! 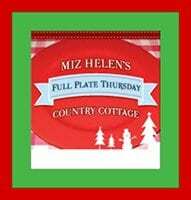 Hope you are having a great day and thanks so much for sharing with us at Full Plate Thursday. We like to buy the Fiesta Minis Variety Pack. That way we get a little bit of everything. 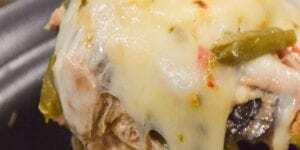 We love the chicken and steak and cheese taquitos as well. 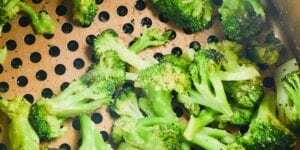 We are going to have some for the Super bowl to snack on during the game! I really like the chicken taquitos, but I love your idea of splitting the crock pot in half with foil to serve both. I have a party crock with four sections for sauces, so will definitely try your recommendations in addition to salsa and queso. 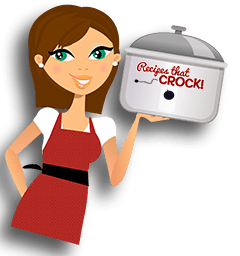 I LOVE MY CROCK POTS! I just signed up to receive emails and will be visiting Oles website for additional game day ideas. Thanks!!! I want a chimichanga right now! I like the breakfast burritos ? I would love to try the Chipotle Chicken Taquitos. I haven’t tried these yet but they sure sound delicious. We lo very the beef taquitos, and would really like to try the chimichangas! Hi, I have to say I love the Mini Chimichangas at Jose Ole. After looking at their Instagram I want to try them stuffed bell pepper style. I want to try their Egg and Bacon Breakfast Burrito! I may be heading to the store first thing tomorrow. I have to say I have been cyber stalking the Swing and Serve and I love what you did with it here. I couldn’t find any youtube individual demos of it and would love to be the first if I am the lucky winner :). I would love to try taquitos and mini tacos. Both of them are my favorites.